Yes, like against Romania and Germany last season. NedRugby wrote: I suppose these are semi-finals and so details of the next round will have to wait. Interesting, if so, as no Belgium. Maybe they have been relegated to the Trophy after all? Not like Belgium to miss out on 15s. Somebody on the men's subforum said Belgium is facing financial struggles and has canned a number of programs, including women's XV, to focus on men's XV and women's 7s. Armchair Fan wrote: Somebody on the men's subforum said Belgium is facing financial struggles and has canned a number of programs, including women's XV, to focus on men's XV and women's 7s. A great pity - Belgium always seemed an ambitious union, frequently sending their test team to England for games against club teams. One other throught on the Euro draw is that home advantage may have been influenced by climate. Unlikely you could reliably play matches in Moscow in February, and even rugby in Germany tends to go into hibernation at that time of year. Because there isn't even a XV league. They play sevens or tens and Sporting assembles a XV team that only plays friendlies and this cup. Anyway I believe they have three foreigners, two Kiwis (one of them was world champion in 2017, Mata'u) and a Brazilian. No, they aren't bad. I was already surprised last year when I saw their forwards and I thought they would have their chance this year given Olímpico's form (6th out of 8 teams in Liga Iberdrola, only two wins, lots of injuries). And of course I'd love to see them play test matches, but it won't be that straightforward. Performance may not translate well and they lack depth. They are thinking about playing in the spanish league if nothing change in Portugal. Years ago there was an idea to mix the north portuguese league with the south galician but finally nothing happens. 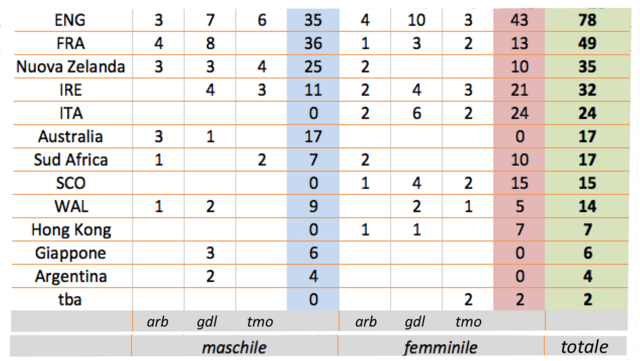 Italy has no one referee in the men's competition, as Scotland, but it's second in the women's one. 29 nations played at least an international game (116 nations in the men's): twenty-eight from the world ranking plus Zambia. Some top twenty nations -Portugal, Kazakhstan, Japan, Russia- didn't play neither a match. The Rugby Football Union announced it would reintroduce contracts for 15-a-side players. Contracts were previously awarded based on the next major tournament. In addition to the 28, seven players are on elite player squad agreements. That is a really strong group of women. "ARWC" in May? All men's tournaments are just "ARC" so I am guessing the "W" is "Women's". Also they just need to avoid relegation in World Series - which they really should do. Do you know if Spain v Scotland will be live streamed, this sunday?